Some holiday traditions get about as stale as last year’s fruit cake. It’s not uncommon for stores to play Christmas music the day after Halloween – or even before! – so by the time Christmas actually rolls around a lot of people find carols cringe-worthy. Not even beloved movies are safe – by December 25th, some stations are on their 1,946th airing of It’s a Wonderful Life and viewers have just about had it with poor George Bailey! One movie that never seems to get old – despite the yearly 24-hour-marathon – is A Christmas Story. From 1983 on, it’s become an icon of an American Christmas. And it just isn’t the holidays for a lot of people until Flick’s tongue is stuck to the flagpole! (We don’t blame Flick – a triple dog dare is serious business!) And we can all identify with Ralphie as he endures the trials and tribulations of kid-dom – the perils of homework, dad’s creative use of the English language, the annoyance of younger siblings, and choking down mom’s meatloaf. All while coveting that one special item that will make Christmas….well, Christmas! If you’re one of the people who gets nostalgic at the mention of a Red Ryder B.B. Gun “with a compass in the stock and this thing which tells time,” we have just the things for you! Ranging from stocking stuffers to major award presents bound to make your Christmas Story fan’s holiday complete. The Old Man’s leg lamp has got to be the most recognizable symbol of A Christmas Story. Not nearly as fra-gi-le as the one in the movie, we offer the Christmas Story Lamp as a scaled-down desk model of the infamous major award! 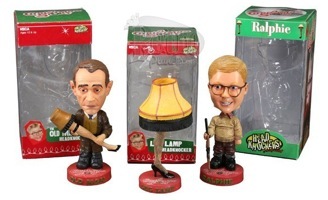 For decorating your mantle or office cube, we have a leg lamp bobble head, as well as a bobble head of Ralphie with his beloved Red Ryder and the Old Man with his major award. Randy was no exception in the long line of kids who don’t enjoy mealtime. Picky eaters are a tough breed, but Ralphie’s mom used humor to get her youngest to chow down. If you’d like to try something a little less stomach-churning, try letting the kids select one of our Christmas Story pint glasses to have with dinner! Each set of 4 glasses has famous lines and scenes from the movie, and the clear glass set features the infamous little piggie scene. Poor Mrs Parker spent a lot of time at the stove! 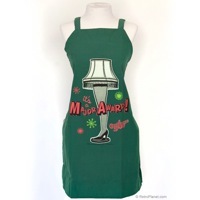 And if the Old Man were out shopping for her, he’d probably take glee in buying her the major award apron – especially during the Battle of the Lamp! 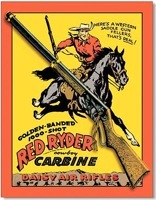 While we don’t offer actual Red Ryder B.B. Guns (’cause someone could shoot their eye out!) we do have the next best thing – tin signs! This one features Red Ryder himself and is sure to make Black Bart flee in terror! Do you have neighbors like the Bumpuses? 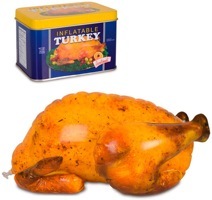 If you’re in danger of losing your Christmas feast like the Parkers, then set our inflatable turkey on your table as a decoy to keep the real bird safe and sound from hungry bloodhounds. Even though we can’t deny the fun of going out for Chinese turkey. So if you’ve had it up to here with holiday cheer by November 3rd, our Christmas Story gift items should help you recapture a little bit of Christmas magic. And remember – be sure to drink your Ovaltine!